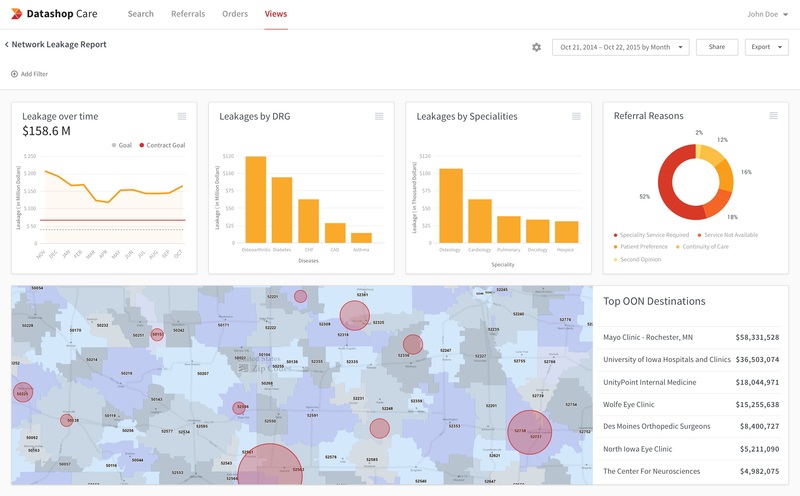 ​Innovaccer Inc., a Silicon Valley-based Healthcare Analytics company, today announced that it will launch its Referral Management Suite at HIMSS 2017 that will enable value-focused organizations to effectively manage referrals and reduce network leakages. Referral Management is built on Innovaccer’s proprietary platform ‘Datashop,' the operating system that powers healthcare. With its capabilities to integrate claims, clinical, ADT, immunization, scheduling and medication data and features like the Integrated Data Lake, Patient 360, Contract Performance Dashboards, In-built Quality Reporter (PQRS, GPRO, HEDIS, etc. ), Datashop provides a holistic Population Health Management platform for care teams partnered with Innovaccer. “Network leakage is a major pain-point for healthcare organizations. Last year, even the top performing organizations saw over 40% leakages, which is a troublesome figure. Our solution will help care teams understand network revenue leakages throughout the network geography and break it down by disease/patient groups. We are confident, with our Referral Management suite, value-focused organizations will be able to improve in-network utilization,” said Abhinav Shashank CEO & Co-Founder of Innovaccer. Innovaccer’s Referral management suite connects clinics, hospitals, physicians, payers and other healthcare providers together on a unified data platform, which enables bi-directional exchange of referrals between different providers and also provides a scalable and reliable analytics infrastructure to give insights about the referral trends, source of leakages, as well as serve as a guide to change this behaviour. Datashop Referral Management uses advanced Big Data and Machine Learning technologies to help healthcare organizations cut through the noise to exactly deliver what information they need to identify opportunities within two clicks. It empowers the management with dashboards for summary level view highlights, key trends in network performance, cost driver analysis, out of network leakages, including leakage PMPM and referral trends, and enables them to make decisions based on actionable insights to deliver better health outcomes. Innovaccer will launch the Referral Management Suite at Booth # 6179-31 in Population Care Management Center at HIMSS 2017 in Orlando. HIMSS annual conference is the industry's largest health IT educational program and exhibition center. For further information about Referral Management, Join Innovaccer team at HIMSS or schedule a personal demo. Innovaccer Inc is a Silicon Valley-headquartered, Healthcare analytics company. Innovaccer’s aim is to simplify complex data from all points of care, streamline the information and help organizations make powerful decisions based on the key insights and predictions from their data. Its proprietary product Datashop enables provider organizations to use data as a source of innovation and has been deployed across 15 countries at academic institutions, governmental organizations, and several corporate enterprises such as Catholic Health Initiatives, Sonic Healthsystems, Stratifi, Harvard, Stanford, MIT, and Wolters Kluwers.